Photos and texts on Web Panel is too bright(whitish). 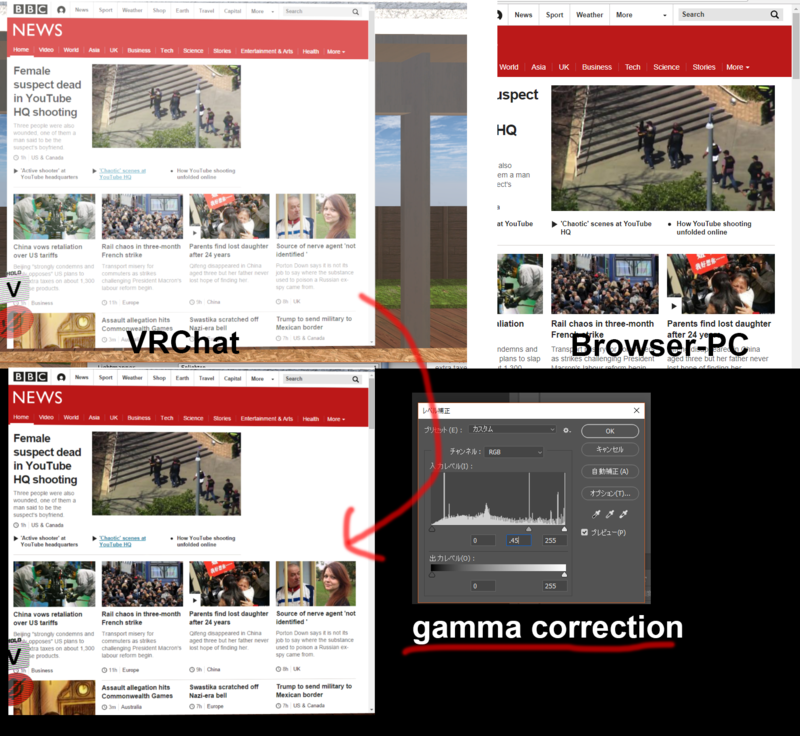 It seems that it's about Gamma that you fixed on Video Player before. I think that it should be corrected using the value 1/2.2 = 0.4545. I found Coherent UI for Unity3D has "Compensate gamma" option. This issue might be caused by mismatching this option and expecting color space of VRChat world. Make another quad for a duplicated material(*). Use "De-gamma(1 / 2.2)" shader for the material. Place the quad the same size as the original Web Panel and place it on slightly forward than the original Web Panel. Remove the collider of the quad to click the Web Panel located it's behind. *Because Web Panel automatically change it's shader "Unlit" when it published. @uuupa: Can you please elaborate on what you mean by "Use 'De-gamma(1 / 2.2)' "
I am not a shader writer, but this sounds like you are telling people to write a shader. Would you mind sharing the full shader?